SmartClean Toddler Booster - Aqua is rated 4.5 out of 5 by 11. 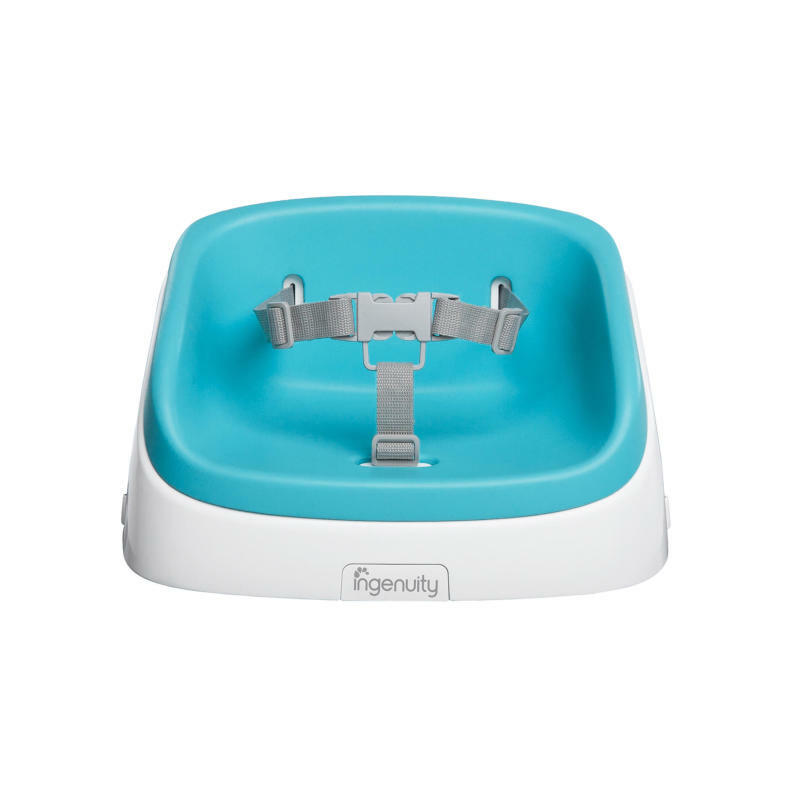 The SmartClean Toddler Booster™ from Ingenuity stands up to the toughest mealtime messes. When your baby graduates from a high chair, this wipeable and washable design is exactly what every toddler parent needs. Just wipe down, so you can spend less time cleaning and more time cuddling, playing or chasing after mealtime. The feeding seat easily straps onto your existing dining chairs and offers just the right height for your little big kid. Even the squirmiest toddlers will sit comfortably on the roomy and soft foam insert, and our 3-point harness keeps your child secure. It’s easy to clean, easy to use, and easy to take on the go. Dimension (in) 11.8" x 13.75" x 6.1"
Rated 3 out of 5 by chcmlc from Good product Our 4 year old has been using this and it works well. Only issue is that the blue rubber cushioning seems to slide out too easily. Good for cleanup, but not so good for a child who constantly wants to take things apart. Some child-proof mechanism to keep it in place would help. Otherwise, very good product! Rated 5 out of 5 by brittany131 from Great Booster Seat! This booster seat is great for toddlers! It makes clean up so much easier! We own another booster seat and the SmartClean Toddler Booster Seat is so much better. Our other one is always dirty. But with this new one, after each meal, I just remove the top part and just clean it off in the kitchen sink. My two year old loves using it and calls it "my seat!" It makes me happy to finally have a booster seat for her that can stay clean. Rated 5 out of 5 by Jade from excellent booster seat I got this for my 2 1/2 year old, and I couldn't be happier. She is usually having to get on her knees in her chair to reach the table comfortably. This eliminates that problem. This one is a lot safer than others that I have seen, as it has straps that buckle both on the back of the chair and underneath to hold it snug and secure. The top has a removable padded cushion that you can take off and clean. The only thing I didn't like about the cushion part is that it doesn't snap in or anything, so if they are not strapped in, they could slide it off. Other than that, it is great. You can also just go without the padding if you decide. Rated 4 out of 5 by Krystal989 from Easy to Clean! This product is great! It is small and doesn't take up much room and on top of that is super easy to clean. The only down side is that the foam cover doesn't attach securely to to the plastic base and slides around. This may be a problem if you have an older child that can get in and out by themselves. Rated 4 out of 5 by Mstattooed from Practical for an older toddler I like the size of this booster seat. It fit a few of our chairs without any issues. The harness is an added bonus for safety. The other straps were easy to adjust to make it fit snug with the chair. The height was not too high or low, and was just right for our older tot to sit in the tall bar chairs at the counter and at the dinner table. Even though the age range is from 16 months-5 years old, it is not very practical for a small tot. I did not feel comfortable using this with my 1 1/2 year old and my 5 year old is entirely too big for it. Maybe once my 1 1/2 year old turns two I will try it out with him. My 4 year old enjoyed being able to sit comfortably at the table and the counter using the booster and it was very easy to clean. It is a good size for travel as well. Rated 5 out of 5 by JB1977 from Easy to attach! This booster seat is perfect for my 2 year old. It straps him in securely without being overly bulky. It was very easy to clip to my dining room chair and gives him just enough boost to sit at the table with us. I love it! Rated 5 out of 5 by cmciver82 from Great space saver! This is the perfect option to save space instead of using a high chair. It's easy to clean and secures to the chair safely.